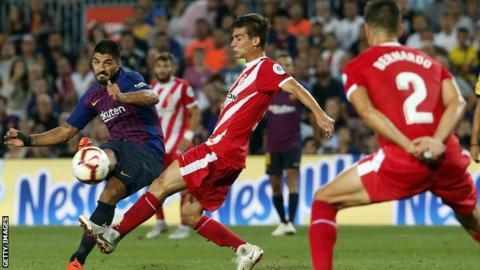 La Liga has taken the Spanish Football Association (RFEF) to court in its fight to play Girona’s home league game against Barcelona in Miami. The RFEF is one of the bodies that needs to give approval for the game to go ahead on 26 January but has not yet provided an official response. The Spanish top flight has filed a lawsuit with a civil court in Madrid to force the RFEF to approve the match. A decision is expected around the middle of December. “La Liga has taken a case to court in Madrid and expect a resolution in the coming days or weeks,” a spokesperson for the league said. It is understood La Liga thinks the RFEF’s role in bringing the second leg of the Copa Libertadores final to Real Madrid’s Bernabeu stadium on 9 December will strengthen its case, as it is a precedent for matches transcending country and regional borders. The RFEF and Spanish players’ union (AFE) have previously been vocal in their objections to the game. AFE president David Aganzo has now said the match will not go ahead next year, but that it could be “possible” in the future. La Liga agreed to play one game a season in the US as part of a 15-year deal with media company Relevent and Catalan neighbours Girona and Barcelona agreed to move their game to the Hard Rock Stadium. In addition to the Spanish FA, the match also needs the approval of Fifa, US Soccer and the Confederation of North, Central American and Caribbean Association Football (Concacaf). La Liga has previously said it will go to the Court of Arbitration for Sport if Fifa blocks the move. Football’s world governing body has not yet formally banned the proposal. RFEF has refused to comment on the court case.